Manicotti is one of the oldest shapes of pasta that is still prepared today much like it was originally made. In ancient times, pasta dough was prepared, cut into large rectangles, filled with flavorful stuffings, and then rolled and baked in the oven. 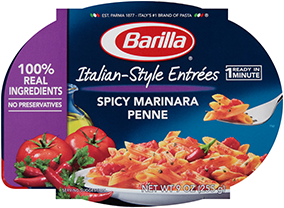 Barilla® Manicotti is made with non-GMO ingredients. For more information, please read our position. Manicotti are known for their generous consistency and heartiness, making them perfect for robust and highly flavorful sauces and the most sumptuous and creative fillings. Sauces can be rich in chunks and abundant with moisture to facilitate oven-baking. Try Manicotti with meat-based sauces like traditional Bolognese, dairy-based sauces like a classic béchamel, or vegetable-based sauces. Boil for 7 minutes, stirring occasionally. Drain and cool on a sheet pan.